Anne is just an average teen, getting through high school and worrying about college. But her recurring nightmares set her apart...nightmares of another girl, trapped. Then strange Ethan appears, offering the answers Anne is looking for, and to beg for her help to free the girl in her dreams—who is actually Anastasia Romanov, the last surviving member of her family. Joy Preble's debut novel is dramatic and magical. 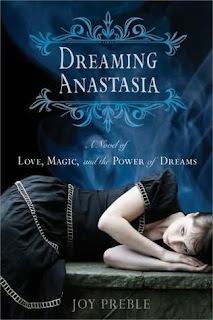 Full of suspense and with twists at every turn, history buffs and paranormal fans alike are sure to enjoy Dreaming Anastasia. The characters are all very unique and diverse, each having their own distinctive voice and contributing almost equally to the story. The plot is full of plenty twists and turns, and the antagonistic elements very serious, making for a more gripping read. The novel is also very well paced, making it easy to glide through, with the exception of the few parts in the story where Anastasia's letters are shown in a nearly-illegible cursive font. But besides those pages, Dreaming Anastasia is a romantic and adventurous read that will not only entertain, but light a spark of curiosity in readers about Russian history. Cover Comments: I suppose the cover is just all right. it doesn't really stand out to me. I do like the font used and the embellishment on the title, but the images just don't do much for me. Follow Joy's entire blog tour! This sounds really good. I've been intrigued by the whole Anastasia story ever since I saw the Ingrid Bergman film. This sounds a great read. I am so happy that you enjoyed Anne, Ethan, and Anastasia's story!